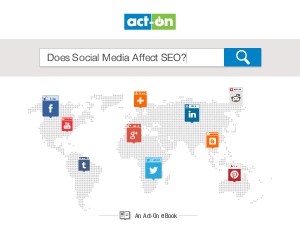 > Research Library > Act-On > Does Social Media Affect SEO? One of the most heavily debated topics in today's digital marketing circles is whether or not success on social media translates to a bump in search ranking in the major search engines. SEO experts are firmly planted on both sides of the fence, with some saying social has no effect on SEO rankings, and others saying it absolutely does. The truth may lie somewhere in between.